91 tickets sold – $333 raised! MAKE A DONATION TO THE MAGGIE MAY FUND FOR A CHANCE TO WIN IT! We will send you confirmation and a PAYPAL link, or email us at: maggiemay99@telus.net, to make other arrangements. Companionship …. “a feeling of fellowship or friendship”. 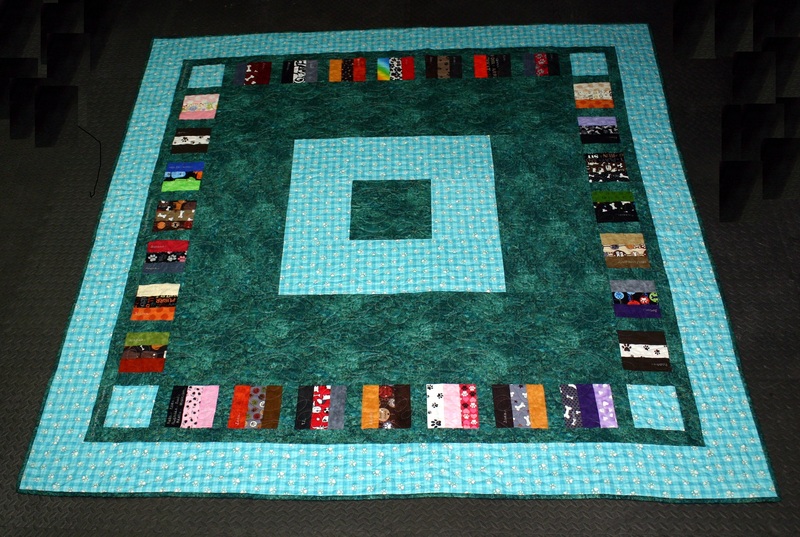 We have named this years anniversary quilt “COMPANIONSHIP”. Our pets enrich our lives in so many ways. They make us laugh and comfort us when we cry. They move us to get out there and enjoy life. We can’t imagine our world without them. They are companions, and so much more. Count your blessings and make the most of each moment, for their time with us is far too short. We are dedicating our quilt to the furry friends we have lost this year …. Josie, Joey, Kes, Ricochet, Rue & Rosie. May you be at peace and know you are forever loved. Our quilt includes the fabrics and names from our personalized blanket orders between May 1, 2016 to April 30, 2017. This gives us time to design, create, and have it professionally quilted in time for the reveal on September 12th. We will once again raffle it off on our anniversary October 11th, the anniversary of Maggie’s crossing over the rainbow bridge, with all proceeds going to the Maggie May Fund. We have 44 names this year, some with a couple of blankets, and 3 different Joey’s. Shine, Poppy, HRH Finnegan, Fysti Archer, Kjell, Snoopy & Angie, Krystal, Rex & Sophie, Rosie, Rosie & Salsa, Joey, Bubbles, Bud, Bella, Zoey, Sideways, Boots, Teddy, Brandi, Misty, Malcolm, Casper, Joey, Lou Lou, Joey, Cassie, HRH Finnegan, Fysti, Simon, Whiski, Kassidi, Edwin & Marlena, Sage & Ronan, Harley, TJ, Cali, Miya and Kava. 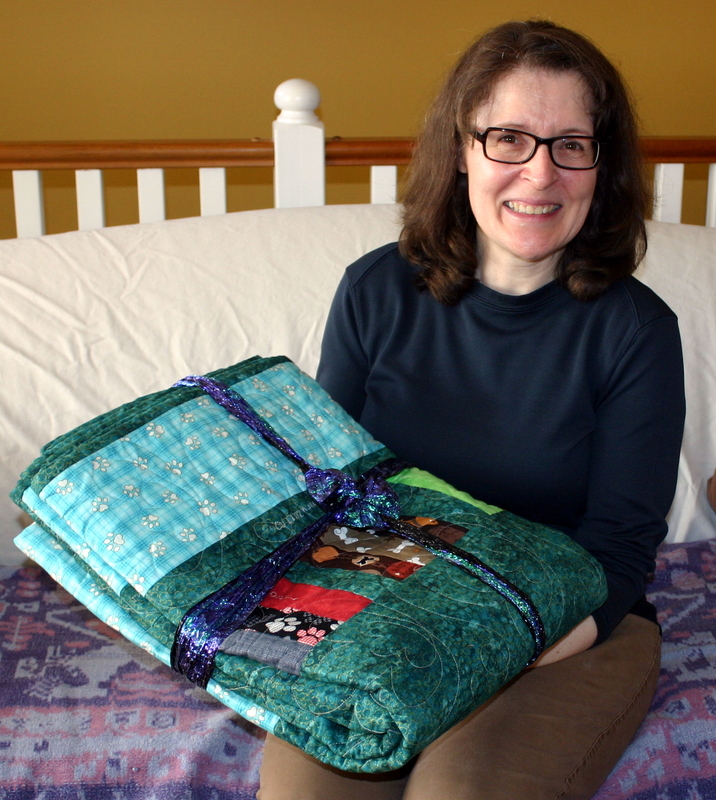 Once again, we would like to send a special thank-you to Tammy Howard of Sugar Town Quilting Co, in Cranbrook for donating her time and cost to professionally quilt our creations. We are so lucky to have her! Check out more photo’s of the anniversary quilt on our facebook page.